GroupWise is a collaborative platform for email communication from Novell. It accomplishes the task of emailing, calendaring, contacts management, task management, and document management, etc. from a single application. The software is supported across various platforms including Windows, Linux, and Mac OS X. Over the years, Novell has released a series of GroupWise versions, the latest being GroupWise 2014. With the ever-growing technology, each version provides some advanced set of features to cater the need for business in an organization. MS Outlook, on the other hand, is a product from Microsoft and provides a familiar working platform as GroupWise. It is used to manage personal information like calendar, task, contacts, notes, journal, etc. In addition, there are features like better interface and security, which makes it a very popular email client among users. Microsoft has released the different version of MS Outlook from time to time, the latest being MS Outlook 2016. Each version is better than the previous version and overcomes all the challenges found in the previous version. Novell GroupWise 2014 allows you to view the attachment of more than 600 file types, without requiring you to install the application. In case any user moves from one server to another, it provides an advanced monitoring tool to resolve any related issues. While upgrading on the server side, you can upgrade in place or move to a new server hardware. When it comes to security, the latest GroupWise 2014 version provides better security than the previous versions. The File Emails can be selected through multiple means like drag/drop, folder selection, and navigation bar. With the growing use of tablets, this latest version is designed to be supported on tablets and various mobile devices. The client is very flexible, as it allows you to select from the following options while selecting a directory: NetIQ eDirectory, Active Directory, No directory option. MS Outlook 2013 supports Shared Folders, which is not supported in Novell GroupWise 2014. However, the method is a little complicated. While working with MS Outlook 2013, you can easily set reminders for tasks, appointments, and emails. You can also configure the MS Outlook 2013 to make an external search outside the Exchange system. In case you want to move between servers, this can be easily done through this client. However, you need to have multiple tools to move from different lower versions to the latest one. In addition, it also has the ability to monitor the move. Moreover, there are many additional sets of features that make it one of the most popular email clients among the users. Organizations, which already have GroupWise as their client can, at times, face some complexities and shortcomings while working with it. Any mishandling or a sudden rash could lead to some serious problems. However, in any of such cases, it fails to stand up to its reputation. In a worst-case situation, it can even lead to loss of data. “The address book deinitialization function was never called by its parent application”. Such an error can be a complete disaster in organizations where e-communications are considered the most important aspect of running the business. However, there are various solutions or alternatives to situations. MS Outlook overcomes all the limitations and issues found in other email platforms and provides a hassle-free communication within and outside an organization. Some of the features of MS Outlook that makes it the most favorable choice are mentioned below. In order to avail all the features of the Outlook, it is required to migrate from GroupWise to Outlook. To do this, you need to convert GroupWise mailboxes to PST file format. The best way to perform such task is to make use of a professional software. There are many professional tools available that can be used. Such tools convert GroupWise to Outlook 2013 and all the lower versions of the client. Note: Most of the tools provides demo version of the software with some limited features. It is better to download the demo version first and know the credibility of the software. However, you need to look for the following features in a professional GroupWise to Outlook Converter. Must provide a demo version to check the credibility of the software before purchase. One tool having all these features is Stellar Converter for GroupWise. Shared folders are supported in GroupWise 2014. In fact shared folders have been around in GroupWise for a very long time. It is enabled from earlier version GroupWise 6 to current version GW-14. In the industry, 1 GroupWise administrator for every 10k users, whereas Outlook requires 7. Groupwise rules. Both Imran and Jacques are correct. 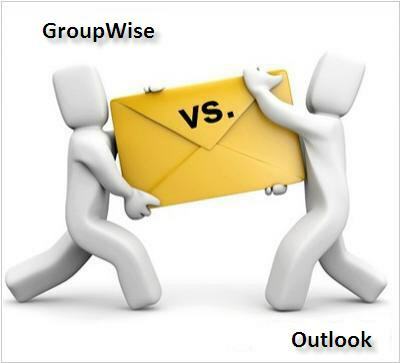 I have been using both GroupWise and Outlook for more than 15 years. GroupWise is much better compared to Outlook. The single feature of MS Outlook is up-to-date only.